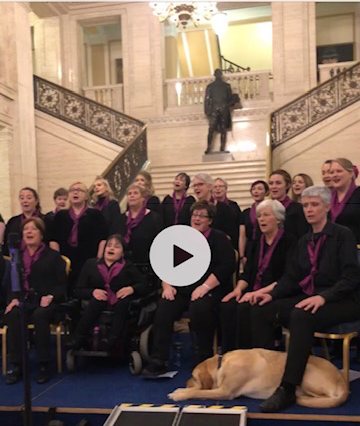 It’s a dog’s life: Three guide dogs joined the magnificent singers of the Open Arts Community Choir at their 18th birthday celebration in Stormont on Friday. Great for we politicians to have company in the dog house! Pic: Ann & Ken. 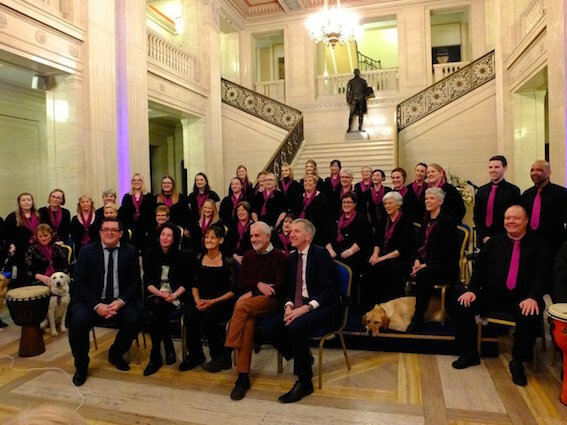 There not much harmony in the House on the Hill these days but there were, thankfully, harmonies aplenty on Friday past when the nightingales of the Open Arts Community Choir gathered at Stormont for a special concert to mark their 18th anniversary. Like all great choirs, Open Arts is underpinned by a mission which goes beyond its amazing choral brilliance for the multi-ability troupe boasts both able-bodied and disabled members. Encouraged by compere John Toal, the choristers relived the highlights of almost two decades of stunning achievements under the guidance of music director Beverley McGeown. The most commonly-used word to describe the close bond between choir members was “family”. The choir’s set was as wide-ranging as it was wonderful, journeying from Burt Bacharch to Percy French with stops in between for a song in Swahili and a rousing Nil Sé Ina Lá in Irish — quite a feat for a choir with only a small number of Irish speakers in its ranks. I have long been a student of the power of song to unite people. So for me, Open Arts Choir isn’t just about music, nor indeed just about those who have the courage to put the ability in disability and rise above daunting challenges. For me, Open Arts Community Choir is at its core an outstanding peace and reconciliation enterprise. Singing is simply the tool the choir uses to touch hearts and remind us that in each of us there is, as the choir’s anthem by Labi Siffre has it, “something inside so strong”. 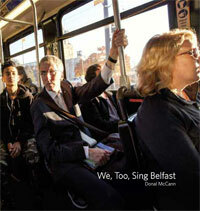 Here’s to the next 18 stellar years of song and no better way to celebrate the staying power of the Open Arts Community Choir than with Stay, the sixties classic made famous by Jackson Brown and, as you can hear on the YouTube clip below, lovingly rearranged for our times by Stormont’s resident songsters. I don’t do those top ten lists but if I did one for Irish centers in the US, for sure the Irish Cultural Center of New England close to Boston and the Irish Heritage Center in Portland would both feature. The ICC is an amazing facility, home to expansive GAA grounds, a hotel-standard clubrooms and boasting a packed agenda. The former St Dominic’s church is the home of the Maine Irish Heritage Center, making it, hands-down, the most beautiful Irish American hub in the US. The splendour and vitality of both centres is matched only by the enthusiasm and commitment of their trustees which is why I am glad both facilities will feature at the Golden Bridges Conference in Boston (linking northwest Ireland and Masschusetts) on 15-16 November. Often visitors from Ireland to the US miss the grassroots groups who are the very cement of the Irish American community across 50 states. Thankfully, the voices of those who built America and Irish America will be heard at Golden Bridges. Their staying power too deserves to be saluted. Encore: A powerful rendition of Won’t you Stay Just a Little Bit Longer raises the roof at Stormont as Lord Craigavon looks on.